After the Lisbon Treaty comes in force, Russia-EU relations won’t suffer considerable changes as they are “inevitable and amicable partners,” President Dmitry Medvedev told a media briefing in Stockholm. “But whoever will be in power, they know the importance of relations with Russia. The same with Russia, whoever the leader will be, the relationship with the EU remains one of Russia’s top priorities in foreign policy,” he said. The Russian President has said he is happy about the results of the summit as Russia and the EU have discussed the whole range of issues traditional for Russia-EU summits – and at the same time, they did it in a constructive manner, without putting too much emotion into it and without creating problems which have stood in the way of such meetings before. As for the Russia-EU agreement which is being developed, President Medvedev said that the work on it will be finished in the nearest future. “The work which we started in Khanty-Mansiysk is going on well, we have already held six meetings and now we are working on the provisions of the agreement. Soon, we will finish work on the whole document,” he said. Meanwhile, RT’s political commentator Peter Lavelle believes Russia is going to be a lot harder on the new partnership agreement with the European Union. “In 1997 the European Union was much smaller – now it’s much bigger, Russia was a very different country then, it was in crisis, it was falling apart – now it is a very different place and the new agreement has to reflect the new realities here, and Russia is going to be a lot harder, it is not going to give in so easily as it did in 1997,” Peter Lavelle said. Speaking about the importance of the economic aspect of Russia-EU relationship, Dmitry Medvedev particularly mentioned the visa issue. “We agreed that the existing visa system is counterproductive for normal exchange between people and creates problems,” he said. And one of the most important results to come out of the EU-Russia summit held in Sweden in terms of economy is that the EU has fully supported Russia's bid to join the World Trade Organization. “We agree on the need to work closely together addressing the crisis, avoiding protectionist measures. In this context I reiterated our clear support of Russia’s accession to the WTO which guarantees fairness, open markets and a better-spread prosperity both for Russia and the EU. We believe that the early accession of Russia to the WTO would solve several issues and also allow progress on the new agreement,” President of the European Commission Jose Manuel Barroso said. Dmitry Medvedev said that the most important point here is the speed of Russia’s accession to the WTO, not the way Russia will do it. “We will choose the shortest way,” Medvedev told the media. Energy issues have also been discussed, in particular energy security and the initiative put forward by Russia, the Energy Charter, and “we came to an understanding in this respect,” Dmitry Medvedev said. The international agenda has also been on the table – the Iranian nuclear program and the situation in Afghanistan and Pakistan. “We were very productive in our cooperation with EU and the US in these areas. 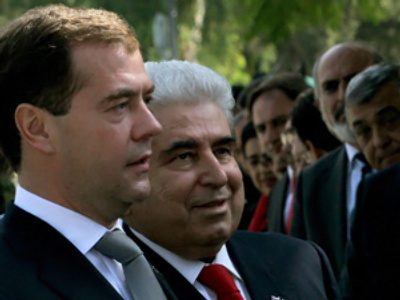 We do not differ in our positions,” Medvedev commented. At the same time, Russia and the EU have differences over the situation in the South Caucasus, but “this is not dramatized,” the Russian President stressed. “On the contrary, we have to find common ground, to find ways to stabilize the difficult situation around South Caucasus,” Medvedev said. Climate change and cooperation in this area has become one more issue closely discussed. “We have the same concerns and we would like to actively cooperate. Russia has always been in the mainstream of the European understanding of what should be done over this problem,” Dmitry Medvedev said.